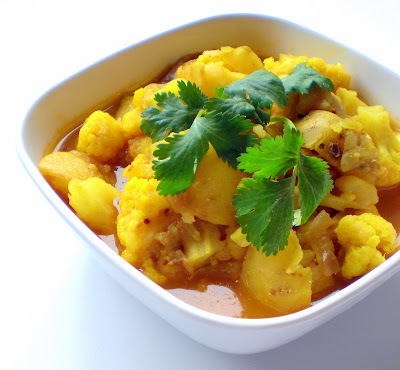 Aloo gobi is one delicious gravy which is healthy and filling. This is a typical Punjabi dish but I added mustard seeds and fenugreek seeds to the gravy for a south Indian touch. I have omitted ginger garlic paste and kasoori methi in my recipe. You can add it for an extra flavor if you wish. Rub fenugreek seeds with little salt in your palm, to reduce the bitterness. Wash and drain. Keep it aside. Heat oil in a wide kadai. Add the mustard seeds, when it pops, add the cumin seeds and fenugreek seeds. Add the onions and fry until light brown. Add the potatoes, cauliflower and 2 cups of water and allow it to boil. When the content heats up, add the salt, red chilli powder, dhania powder and turmeric powder and stir. Cook until the vegetables are tender. Garnish with coriander leaves. Serve warm with Chapathis. This recipe is my entry to “Ode to Potato” event hosted by Sia of Monsoon Spices. nice entry...i rarely use fenugreek seeds in my food...i like the idea of rubbing them with salt to reduce the bitterness. I love curried like these. The aloo gobi looks so delicious, Mythreyee. Love the color. Great Entry! I like to the idea of of not peeling the potatoes. Thats one lovely, yummy Aloo Gobhi curry Mythreyee.. Love the color..:DD..Nice, classic entry. fenugreek huh? Does it make the dish a bit bitter? I dont peel the skin too for most recipes. You bring out such a lovely color of this curry Mythre. Pic is so nice i kept on staring it for a while :)) . Thanks for your vote and comment . Hugs to you .